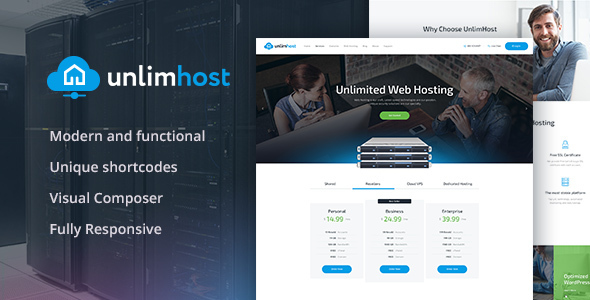 UnlimHost is a powerful multipurpose WordPress Theme that offers everything to create a highly functional website for a web hosting or any technology business. The theme is quite versatile, and can be used for any corporate, business and company websites. Shortcodes and widgets compatibility allows you to build tons of pages with different layouts for displaying all your companyâ€™s services and offers. The theme is compatible with the premium plugins, like Revolution Slider, Essential Grid, Visual Composer, MailChimp for WP, etc. thatâ€™ll make your work a lot easier. UnlimHost is fully responsive and 100% Retina Ready which makes the theme look splendid on any device.